I think mystery readers—and writers—share a fascination with paths. What will happen if I go down this way? What might I find over that way? Maybe there’s a body in the tangle of bushes, or an abandoned house behind that crumbling wall. Of course, our paths aren’t always physical. We’re constantly choosing: to go to school or get a job; to get married or backpack across Europe; to do the right thing…or the easy thing; to earn money or try to write. Over the past forty years, I’ve made a lot of choices. And when I find I’ve made a bad one, I either work to make it right—or I make another choice. I decided long ago to write, a path I’ve never regretted, though it’s often been steep and rocky. The beauty of writing (or reading)—especially mysteries—is the opportunity to try many more paths than anyone could ever cram into a single lifetime. Mysteries also give us the chance to be braver than we ordinarily are. Our hearts may be pounding with apprehension but we push open that creaking gate and follow that dark and overgrown footpath, despite the stealthy footsteps behind us. With my Australian cattle dog, Elvis, I’m always being drawn down one interesting path or another. As we go along, I’ll be sharing some of them with you. 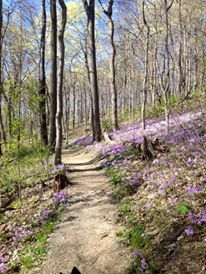 The picture above is a springtime glimpse of one of our favorite trails. We took a path we’ve taken many times, but that particular day, we discovered something new. We found a treasure, though it wasn’t buried, and it wasn’t gold, money, or jewels. The phlox was blooming, and I literally stopped and gasped when I saw it. We never know what we might find when we get out there and keep our eyes open.